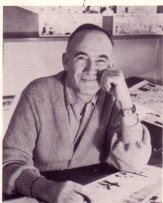 Buford Tune appears to be one of the forgotten cartoonists of the mid-20th Century, even though he had a comic strip that ran for nearly 30 years. I’d never heard of him or his strip which made this article about him all the more fascinating. Continuing my series on cartooning and cartoonists, Tune sang about his own work back in 1964. This is pulled from an oversized saddle-stitched magazine from Allied Publications with the creatively-challenged title These Top Cartoonists Tell How They Create America’s Favorite Comics. It featured an introduction by Beetle Bailey’s Mort Walker and was compiled by Allen Willette. “My first cartoons that appeared professionally were in the 1925 Dallas News, outstanding daily paper in my native state of Texas. Before turning professional, however, I received a scholarship at Abilene Christian College to do cartoons and illustrations for the college year book. 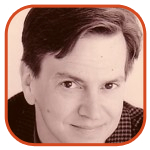 “I studied art and life drawing under the late John Knott, cartoonist for the Dallas News. I took an art course at the Chicago Academy of Fine Arts, and burned the midnight oil over three correspondence courses in cartooning. “My first syndicated comic strip was called Doings of the Duffs. This was an attempt to carry on an old family comic. The next dozen years were spent doing movie ads and publicity for Paramount’s home office in New York. Nights I did one-line gag cartoons for leading magazines. My wife, “Tibby,” acted as agent for the magazine cartoons. Publishers Newspaper Syndicate must have been desperate when they asked me to do Dotty Dripple in 1944. The strip, however, has run ever since. The strip appears daily and Sunday throughout the United States and Canada. It also appears in foreign languages in Europe and Latin America. “I have regular ‘gagfests’ with an assistant; sometimes in my studio, but usually by telephone. He’s good at kid gags. Then we each write separately, and pool the usable gags. “I do all the drawing except for the inking and lettering. I have another assistant who comes in one evening each week to do that job. Isn’t Buford Tune the greatest name ever? It’s like “Buford Tune, Musical Detective,” finder of missing notes and lost chords. He works for scale, of course. He got a scholarship to do cartoons for the yearbook? Cartooning was so different back then! 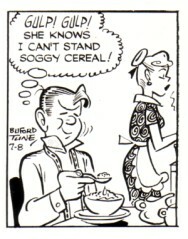 If Doings of the Duffs was an attempt to “carry on the old family comic,” Dotty looks a lot like an attempt to duplicate Chic Young’s Blondie, complete with the weird Dagwood-style cowlick on husband Horace. Here are three pieces of original Dripple art by Tune that very much resemble the Bumsteads. I totally like Buford’s layouts, and I have a shirtcrush on what Horace is wearing in the second strip. Don’t show that art to anyone at Hot Topic. Toonpedia says Dotty Dripple ran for nearly 30 years, ending in 1974. Buford died in 1989. Newspaper cartooning was such a different beast back in the mid-20th Century. Even an obvious knock-off of Blondie could get nearly 30 years in syndication. It’s not uncommon for syndicated cartoonists of that era to have some help - Tune’s got a gagwriter to help him out and an assistant for inking and lettering. But his assistant can ink and letter a week’s worth of strips - 6 dailies and a Sunday page - in just one evening a week? If you just look at that in terms of numbers of panels, he’s inking the equivalent of 3 comic book pages in an evening. Mark Evanier talks about the relationship between artist and assistant in one of his POV columns. According to this site, Tune’s assistants on the strip were Hi Mankin and later Jim Westermann, and his gag buddy was Howard Boughner (who also worked on Wash Tubbs). Previous posts based on Willette’s book have been on Dennis The Menace’s Fred Toole. And my post on Steve Roper and Mike Nomad’s William Overgard can be found here. And the one on Popeye’s Bud Sagendorf is over here.